I’ve been playing events on the EDGA Junior Tour since I was 12. The second “Major” tournament of each year after the Stroke Play (I won the earlier this year), is the Match Play Championship. It’s a tournament I won in 2016 when I was 13, finished second in 2017 to Lydia Swan, and looked forward to playing this year to win both majors. 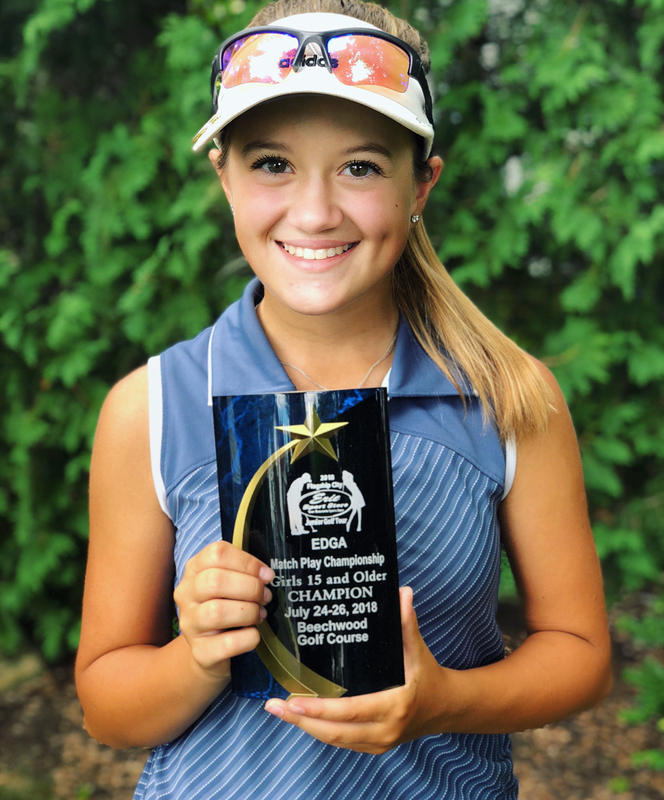 The 2018 EDGA Junior Match Play Championship was held at Beechwood Golf Club. A few days ago in the qualifying round, I shot my lowest 18-hole round of +2, 74. I played very well because I hit straight drives, hit a lot of greens in regulation, and got up and down when I needed to. I entered the match play rounds as the #1 seed and I was excited to play them. I won my first match 9 &amp; 8. We tied the second hole with a par. I was glad I played well and won as quickly as you can win an 18-hole match. The next day, it was time for my second match! I was playing against a soon-to-be senior from Villa Maria Academy. She was a girl against whom I’ve had many close tournament rounds, though I usually came out on top. I’d also beaten her in the final match to win the Match Play in 2016 in sudden death. I was confident since I usually beat her in stroke play tournaments, but in match play the outcome is far less predictable. Won the qualifier for match play yesterday!! Played today and won 9 & 8. Excited for tomorrow’s match!! I started off 1 up on the first hole with a birdie! I was never down in the match but my opponent did manage to square the match at a few points. I made two birdies and two pars in a row near the end and closed her out on the 14th hole, 5 &amp; 4. After a break for lunch and a few more putts on the practice green, I started my final round of the tournament against Anna Swan, Lydia’s sister. I started par bogey and she started birdie par which left me two down through two. I pulled myself together and told myself I could do it and there were plenty of holes left. The match was very close – when I would win a hole she would win the next. I was still two down after 12 when my step-dad showed up to watch after he finished teaching for the day. I ran in a long birdie putt at 13 to get to one down and I just missed a birdie putt on 14 to halve the hole. I won the 15th with a two-putt par to square the match going into 16. I pushed my drive a bit and then, from 175 out, and a pond short left, I hit a hybrid that bounced just beside the hole and into the fringe. Anna responded with a shot almost as close, and we both two-putted for pars to halve the 16th. We were all square and it was nearing the end. I could feel the adrenaline building up inside of me and I thought about the title and the trophy. That adrenaline helped me win the 17th hole with a birdie! I was one up going into 18. I hit a drive that cut into the right rough and had a tricky approach shot to a front right pin, set up on a tier with the green slanted away from me. I hit it and it rolled on the left side of the green and I had a tricky putt. Anna hit her approach from the fairway to about ten feet! I ran my first putt up the tier and across the green about six feet by the hole – I had to make sure it got up on the proper tier. Anna could square the match with her birdie putt, but she left it short and I conceded her par, so all I had to do was make my putt. I read my putt and lined up carefully. I knew this putt was so important and I lined up and visualized the ball rolling in. And I made it!!! I was so excited to be the 2018 EDGA Junior Match Play Champion, and to have come back from two down with six to play going two under in that stretch made it even sweeter. I’d gone first, second, and first in my last three EDGA Match Play Championships and had won both majors for the EDGA Junior Tour in 2018! Here’s the GoErie article on my win and some photos.